The Allavino CDWR34-1SWT Cascina Series is a single-zone wine cooler. This compressor-based unit can accommodate 34 wine bottles. It has black cabinet with stainless steel framed glass door. There is UV tinting on the glass – a good UV light protection feature. The racks are removable wooden shelves. This Allavino CDWR34-1SWT Cascina model should be installed as free-standing only. The Cascina CDWR34-1SWT has a single-zone cooling system; temperature range: 39°-65°F. 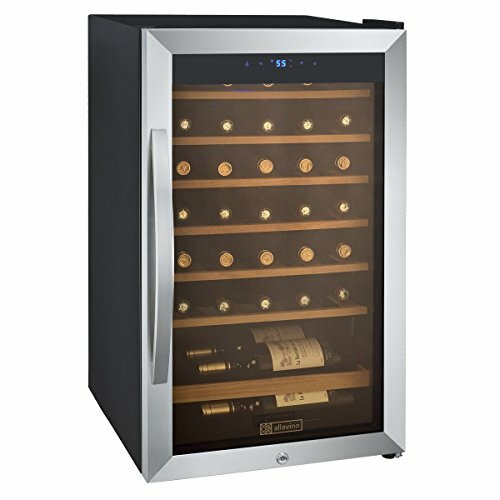 This temperature range can accommodate storing either red or white wines. In general, store your red wine within the range of 55°-65°F; white within the range of 40°-50°F. Tip: if your collection is primarily red, you can store a couple of white at the red temperature for up to three months. Just do a quick chilled for the white before serving. The Cascina CDWR34-1SWT has a digital temperature display with push button controls. This convenient feature allows you to monitor and easily set the preferred temperature for your wine collection. Cascina CDWR34-1SWT features six removable wooden shelves, each rack can accommodate five wine bottles, total capacity of 30 bottles for the shelves. You can store an additional of four bottles at the bottom of this unit. The bottom storage area can accommodate bigger size of bottles easily. It has a wine bottle guard bar at the bottom –great feature. This Cascina CDWR34-1SWT has blue LED light with On/Off switch – to illuminate the interior to show off your collection. It has a front lock and includes two keys. This Cascina CDWR34-1SWT comes with one-year limited warranty by Allavino. Summary: If you are primarily a red wine or a white wine collector, this quiet Allavino Cascina CDWR34-1SWT 34-bottle wine cooler (view on Amazon) is a good candidate for your consideration. It has a modern design with a good capacity of 34 wine bottles. It features a digital temperature control and an excellent wide temperature range of 39°-65°F, and it includes automatic defrost. It has removable shelves and has a front lock. This model is one of our top picks in the Cascina series – reasonably priced, attractive design and features Allavino’s proven vibration dampening system.